Following the recent emptypiegate scandal, I thought it would only be fair to give ASDA a chance to redeem themselves. 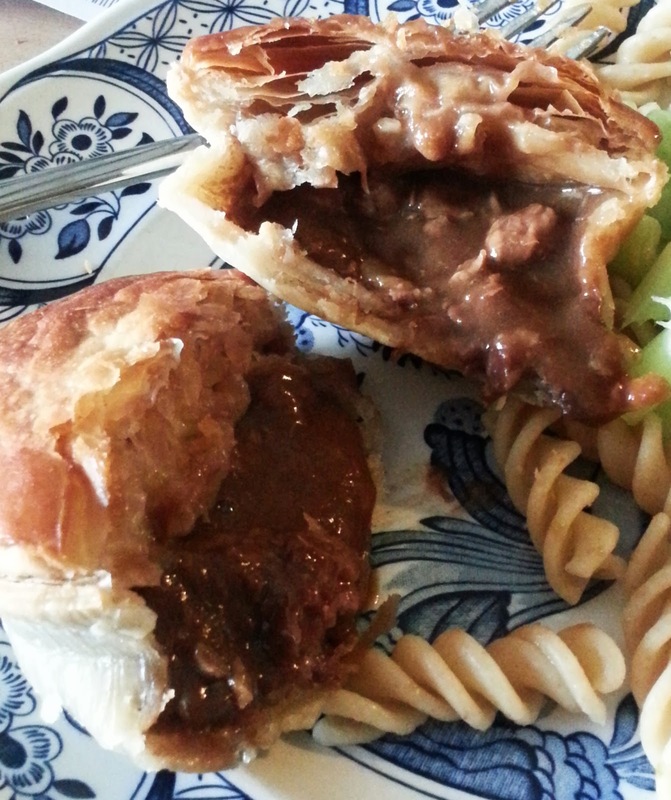 I head to the supermarket giant's frozen section and pick up a pack of 4 ASDA Steak and Gravy pies (624g) for a bargain-bucket price of £2. £2 for four pies? ASDA seem to be giving them away at that price, especially since my recent ASDA pie purchase set me back £2.88 for a single pie. Is this a false economy, though? Have I bought another empty pie of disappointment? The pie itself looks pretty neat, and the colour is a nice golden brown on top although for me a bit pale and uncooked around the sides and base. These pies are in fact pretty minuscule, so the promise of "4 pies" on the front is actually a bit misleading. If you added three of these pies together then you might reach about the size of an average pie, so what I've really got here is a "1.333 pack" of pies. 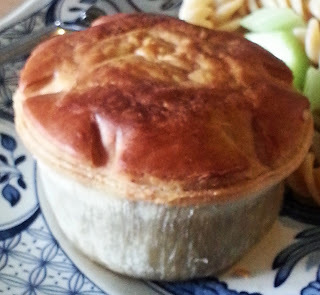 Anyway, let's get stuck into the pie itself. Opening up the pie, the puff pastry top gives an nice crisp crunch. There seems to be quite a large amount of gravy here relative to the amount of steak, although I can count more than one-and-a-half bits of steak so it's already doing better than its more expensive counterpart. The steak seems to be of satisfactory quality - not too chewy. The gravy is a little runny for my taste, but it tastes okay. There's nothing groundbreaking here, but the pie seems well filled and of satisfactory quality for the low price. 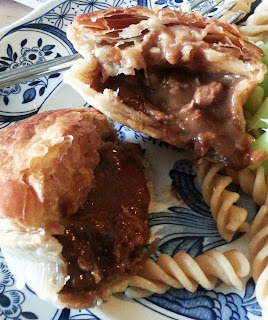 There's probably about as much content in this mini-pie than there was in ASDA's premium empty bistro pie. All things considered, a decent little effort from a pie that didn't promise much. Obviously the pie could have been larger, but I actually really quite enjoyed this pie for the price I paid. And I still have three left.